I have a delightful little book to share with you today! 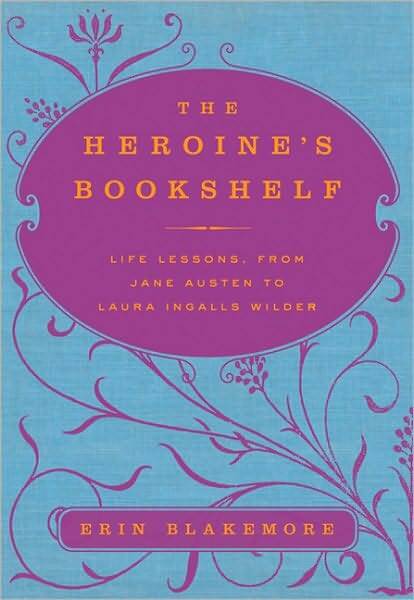 I mightily enjoyed Erin Blakemore’s The Heroine’s Bookshelf: Life Lessons, from Jane Austen to Laura Ingalls Wilder. Blakemore’s message is this: we are all heroines in our daily lives, or at least we can and should be; and we have a wealth of heroines to learn from. These are the women of our favorite books. She organizes her book by chapters which each deal with one lesson or attribute (including dignity, happiness, and simplicity), represented by one author (all are women) and one female character, from one book or series. I would love to list them all here for you but feel I should leave you something to discover when (not if!) you pick this book up yourself; so I shall tease you with Alice Walker and Margaret Mitchell, on top of the two authors Blakemore names in her subtitle. It’s a very sweet, comforting, and comfortable little book. Twelve chapters explore twelve women’s literary impact on our world. Eleven of them I definitely call classics; one I’d never heard of! but of course I don’t know everything. Blakemore’s approach is intimate and loving and a touch incisive. It’s not an academic or intellectual book, but it’s not what you might call “fluffy”, either. She did do some research, I’m sure, as she discusses not only what’s between the pages of the books in question, but also notes biographical details about the authors and draws some conclusions. For instance, I didn’t know about the 2008 revelation by the descendants of Lucy Maud Montgomery about her death. This book is not too serious – a light read – but an important one, at the same time. I am absolutely inspired to read, and re-read, the books examined here. I share Blakemore’s love for Jo March, and I wonder at her selection of Jane Eyre over Wuthering Heights, but we’re all unique, individual heroines, aren’t we. I marvel at her call to compare Frances Hodgson Burnett to Britney Spears and Amy Winehouse! but I admire her for it, too. Again, the adjectives that come to mind are comfortable, almost warm-n-fuzzy. I need to own this book; the library’s copy will not suffice. And I think YOU should own it, too. Who am I talking to here? Well, I readily accept that many of these books are “girls’ books” (or women’s). But some are absolutely essential to us all: A Tree Grows in Brooklyn, for example, is an important book all around. This book is directed at women, but is not necessarily to be enjoyed by them exclusively. I’m sure you know who you are. I’m so glad I found this little jewel. I hope you’ll find it, and enjoy it, too. Edit: My mother asked who this author is, and I had to go looking for the answer, so here it is, Mom: she calls herself “a writer, entrepreneur, and inveterate bookworm” on her website, and I was immediately drawn in to her blog and have added it to the list of blogs I follow.